Valley was (and is) the last station before the terminus at Holyhead. At the time that this site covers, the station was closed to passenger traffic, although it has since reopened. 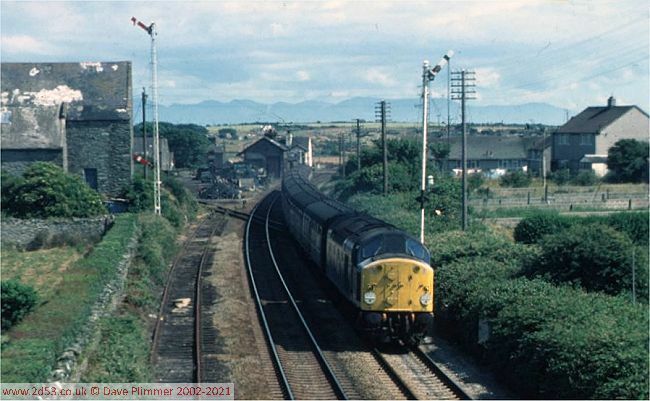 However, there were two sidings in the station area producing freight traffic - the original goods yard, since closed, and the CEGB sidings which remain to service Wylfa nuclear power station. 40119 heads through Valley on the last leg of its journey to Holyhead. Visible is the trailing connection from the down line giving access to the goods yard - still open for coal traffic at this time. 17th July 1976.